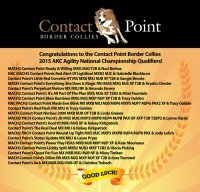 At Contact Point Border Collies we strive to breed great performance Border Collies. Contact Point Border Collies are bred for excellent temperament, good health, drive, bidability, and natural working talent. 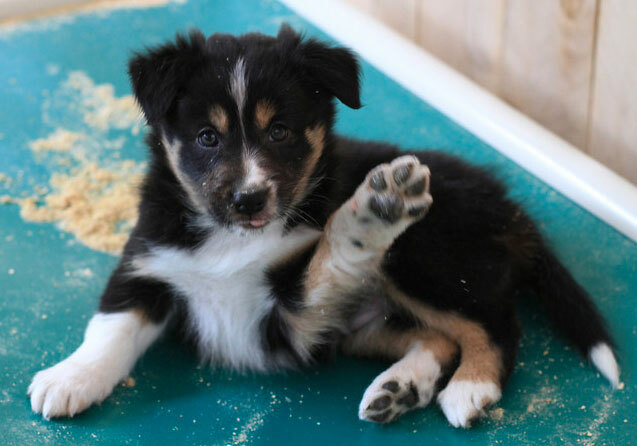 Border Collie puppies and adults are available for sale. Karen Moureaux is the breeder of Contact Point Border Collies and has owned Border Collies since 1989. Karen and her Border Collies have competed in a variety of dog sports including Dog Agility, Herding, Flyball, Obedience, Dock Diving and Frisbee. Karen and her first Border Collie, ADCH Dusty Dallas Rose MX, MXJ, CDX, FDCh, competed on 4 United States World Agility Teams traveling to Spain, Austria, Belgium, and Switzerland. Karen and Dallas have also won both the USDAA and AKC National Agility Championships, as well as placing in the finals in other years. Karen's other early Border Collies include ADCH April MX, AXJ, FM and ADCH MACH Ravin. Ravin came into Karen's life as a "re-home" in 1997 and has gone on to qualify for both the USDAA and AKC National Championships, making the finals in USDAA Grand Prix twice, where she placed 3rd in 1999 and AKC National Championships, where she placed 4th in 1998. More recently, Contact Point Border Collies have gone on to great success in Agility. 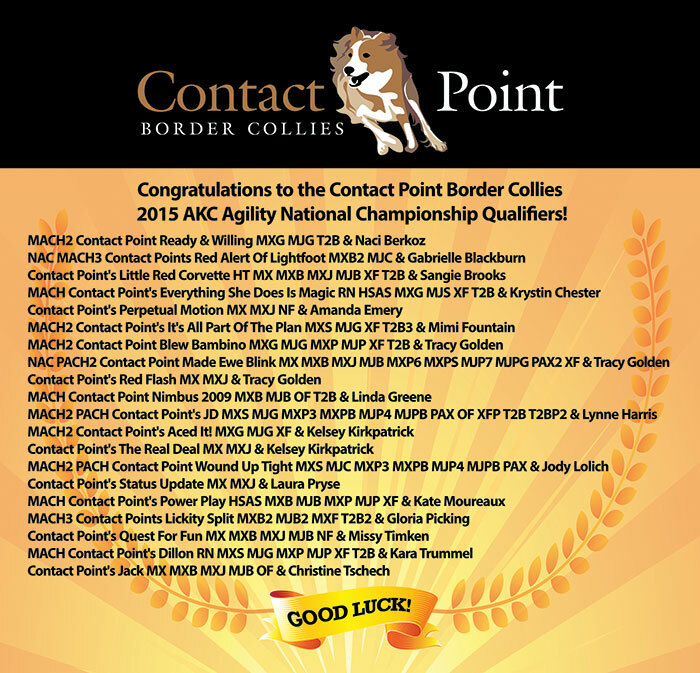 They have gone to win the AKC Agility National Championships (Quick in 2006, Driven in 2008, Zing & Blink in 2012), compete on the USDAA/IFCS World Agility Team (Quick and Luz, 2006, & Driven in 2008), and compete/place in the USDAA Grand Prix and/or Steeplechase National Championship Finals (Quick, Driven, Luz, Soda, Jammer, Cyclone, Zing, Stat, Ace, Blink, Bam, Will, Psyche, Power and Indy). Contact Point Border Collies are also excelling in Herding, Flyball, Frisbee, Dock Diving and other dog sports. Karen's understanding of competitive dog sports has helped to form her vision of the Border Collie that she believes will excel in dog sports and has also fired her desire to produce great performance Border Collies.